When Auntie Mabel, the advice columnist for the Ravensford Chronicle, dies by choking on a shrimp at the Big Bun all-you-can-eat shrimp and lobster night, Laura Magee takes over her job. Laura’s answer to the letter of a Ravensford resident concerned that a house being built in his neighborhood will interfere with a local historical site requires her to put on her her hat as an investigative reporter to ferret out the truth. The search leads to someone throwing rocks at her, and when this someone turns up dead, Laura finds herself at the top of the suspect list. This would seems to be enough for Laura to worry about, but she is also concerned because her housemate, Ronnie, has fallen in love with the wealthy but naive Everett Houser and Laura finds herself in conflict with Nick Manning, Everett’s best friend. It turns out that Nick is also the architect at the construction site that Laura is investigating, and that he is attracted to her. Laura decides that only by breaking the rules will she be able to discover the identity of the murderer and come out with a really terrific story. 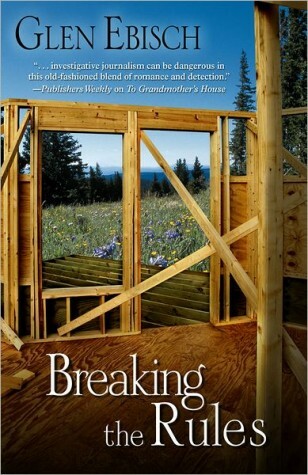 Breaking the Rules is a fast-paced, humorous mystery set in western Massachusetts. It has murder, romance, and other questionable behavior as seen through the eyes of twenty-something Laura and a cast of unique characters.